Thank you, I think I'm going to find IR work very addictive! Yup. IR can really be hot stuff. I really can't see how. You need a pit-viper transplant. Makes it easier to visualize the image beforehand. Also helps driving at night. You need a pit-viper transplant. Like I need another hole in the head. Make that two. K10D and D FA 28-105, 4 image pano merge. Glad to hear it. Thanks Mike! One of my favorite panoramas that I have taken over the years. It consists of 9 shots, turned into 3 HDR images via Photomatix Pro, then stitched together using HUGIN panorama software. These colors are accurate to what was actually seen that day. A friend of mine called me one afternoon and told me that if I didn't get outside to see this sunset, I would regret it for the rest of my life. So I ran out back and saw the most amazing colors. So I jumped in my car and drove a block and a half to the local hospital parking garage, went up on the roof 3 or 4 stories up, and took this panoramic from the middle of town! That first one is spectacular! The second is good too. K10D A 35-105 f/3.5, 5 image pano merge. 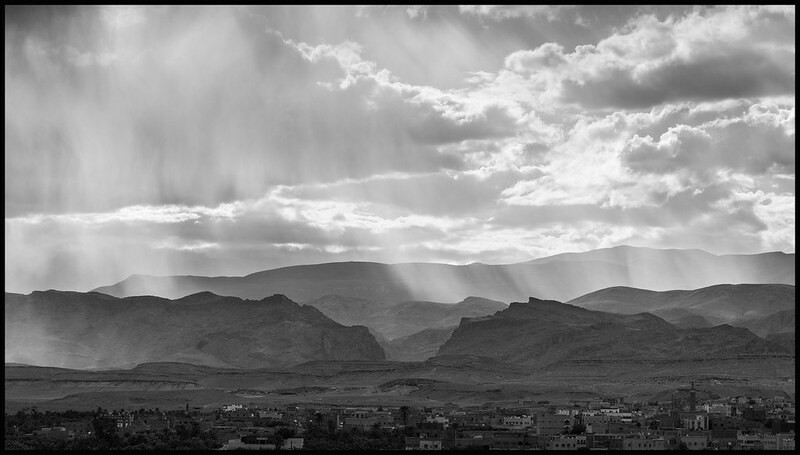 Rain over the High Atlas foothills, Tinghir, Morocco. K-5 II, DA 70mm Limited, stitched from three landscape orientation frames in Hugin (crossposted from "Just Black and White-ur B/W Monochrome photos here").